Pledging her loyalty to the North at the risk of her life when her native Virginia secedes, Quaker-educated aristocrat Elizabeth Van Lew uses her innate skills for gathering military intelligence to help construct the Richmond underground and orchestrate escapes from the infamous Confederate Libby Prison. An interesting story that sets to re-tell the tale of a real-life Civil War hero. From the point of view of Mrs. Elizabeth Van Lew, a Unionist living in Virgina who believes in abolition. Chiaverini shows how a woman could skillfully and intelligently collect intelligence to help the Union as well as Union prisoners throughout the Civil War. I must admit that I knew absolutely nothing about Elizabeth van Lew going into this book. She was a very real person living in Richmond and was horrified by the vote to secede from the Union. She was a woman with strong political feelings and she associated with many men active in the government of Richmond. 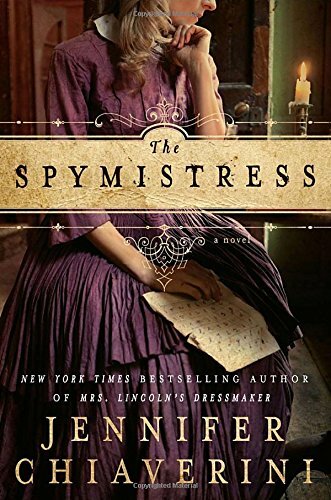 The Spymistress tells a fictionalized story of her courageous acts during the Civil War. I must admit upfront that I have read a lot of Civil War books - I find myself fascinated by this period in our history. That being written, I still had not heard of Miss van Lew! Most of my reading was about the different battles and the generals. So little has been written about the contributions of women during that time period. I really enjoyed this book - it takes the reader from just before Virginia's decision to leave the Union to about 10 years after the end of the Civil War. The bulk of the book takes place during the period of the actual war. It follows Miss van Lew's efforts to help Union soldiers being held prisoner in Libby Prison in Richmond while still maintaining her relationship with her Confederate neighbors. She had to walk a fine line. I thoroughly enjoyed reading this book showing the impact of the Civil War through the eyes of one woman determined to do what she could to stay firm in her beliefs. I'm not going to go into how Miss van Lew did her spying - that will spoil the book - but let me say she was very clever and very willing to do anything she could to help the Union. Never underestimate the drive and determination of a woman. If ever anyone were to question that statement, all one needs to do is read about Elizabeth Van Lew, particularly Jennifer Chiaverini’s The Spymistress. Minutely researched, Ms. Chiaverini explores Miss Van Lew’s fortitude and her unwavering loyalty to the Union at a time when such thoughts were enough to be executed for treason. In many ways, The Spymistress feels like a companion novel to The Secrets of Mary Bowser by Lois Leveen. While Mary is the secret spy within the home of President Davis, Bet is the mastermind behind her position. Reading the two novels together gives a great, well-rounded picture of the intricacies of the spy ring and the dangers entailed. However, reading them together is completely unnecessary as THE The Spymistress is an excellent portrayal of early military intelligence gathering, focusing on the spymaster rather than on one of the spies. As terrific as the novel is, there is an overall lack of tension that is disconcerting. Ms. Van Lew was risking everything for the Union, but one never gets the impression that her life was truly in danger. Sure, Ms. Chiaverini does mention the hazards many a time, but a reader remains comfortable with the thought that she is going to survive the war, if not completely unscathed then without any major threats. If anything, Ms. Van Lew survives the war better than most of her compatriots or the entire Confederacy. She still has money and food, her property, her family, positions of influence and power, and connections in high places on both sides. It doesn’t lessen one’s interest but it does lessen the story’s overall impact. Another element of discomfiture is the distinct lack of specifics. While the book is remarkably detailed in certain aspects, it is lacking in some of the more important areas – especially regarding the spying ring. Ms. Van Lew’s ring grows organically but without any fanfare or any real information. She seems to have her hand in a lot of the pieces, but at no point is it very clear the scope of her arrangements. Nor does Ms. Chiaverini ever share the type of information smuggled to the Union. Everything is kept at a very generic level, which is disappointing and somewhat frustrating. Because much of the novel follows Ms. Van Lew from threat to threat, as she works to outmaneuver the Confederacy and help her beloved Union, The Spymistress bogs down in its own repetitiveness. She uncovers a new indignity on the part of the Confederacy, works to best those making the decisions, comes close to incarceration but manages to avoid it through a well-timed expression of Confederate devotion through a large social gathering that typically serves to either disseminate information or gather more dangerous evidence. Rinse and repeat. While the scenes are fascinating to watch with their battles of wit and will, the formulaic approach to the story becomes tedious. Last year I read Jennifer Chiaverini's historical novel Mrs. Lincoln's Dressmaker and found it quite enjoyable. I like to read novels based on historical people, and getting a different perspective on Mary Todd Lincoln was fascinating. Chiaverini's new novel The Spy Mistress is inspired by the true story of civil war espionage. Lizzie Van Lew was from a prominent Richmond Virginia family. She lived with her widowed mother Eliza and her brother John, a hardware store owner, his wife Mary and two young daughters. They were staunch patriots and disdained the institution of slavery. When Virginia seceeded from the Union, the Van Lews were stunned. Many of their neighbors supported the Confederacy, and the Van Lews were forced to keep their Unionist views to themselves to avoid being arrested. Richmond became the capitol of the Confederacy, and when Jefferson Davis was chosen as it's president, he moved his family (whom we met in Mrs. Lincoln's Dressmaker) to the city. Richmond also became home to prisons housing Union soldiers captured in battle. Lizzie decided to help the Union cause. Under the guise of providing charity in the form of food and books, Lizzie asked for permission to visit the Northern prisoners. She came under suspicion from her neighbors and the Confederate leadership for this, but it was allowed. During her visits, she met with Union soldiers who gave her information, including the names of all the men imprisoned, to smuggle out to the North. One of the Union prisoners created a clever code, by punching letters on the pages of a book, that Lizzie quickly figured out. That impressed me a great deal. Soon Lizzie had recruited other Union supporters, including freed blacks, to become part of the spy ring sending messages to the Union generals on the battlefield. They even placed a spy inside the Davis home who discovered troop movements and strategies that Lizzie was able to send North. This is an intriguing look at the Civil War from another perspective, that of the Southern Union patriot. There is tension in the novel as Lizzie waited for the Union troops to retake Richmond, which takes years before succeeding. Lizzie's neighbors, as well as her sister-in-law who strongly supported the Confederacy, became more suspicious of her, and she worried that her mother may suffer for it. Her mother Eliza is a terrific character; she supported Lizzie's efforts, but better understood the importance of appearing to be a true Confederate. Lizzie says Eliza "was the very ideal of a Southern lady- kind, gracious, polite, well spoken, pious and charitable." She was also intelligent and tough when she needed to be. Lizzie used her feminine wiles to her advantage, winning over Confederate prison officials, like Mary Todd Lincoln's brother, with her charm and bribes of food and drink. She was underestimated by the Confederate military leaders who didn't count on Lizzie's intelligence or gumption to get what she wanted. Elizabeth Van Lew is a woman born into a family with both privileges and significant social standing. A proper Southern lady, Lizzie stands out from all her other peers because of her intelligence and more importantly her passionate love and loyalty to the United States of America. Her beloved country is being torn apart and being a staunch Unionist, she cannot just idly stand by and watch as brothers are pitted against brothers, neighbour against neighbour. Her actions and her courage will paint her as a treasonous villain by one side of the war, and a fearless heroine by the other. History will remember her as a woman of immense fortitude and an unwavering belief in the spirit of freedom and equality for all people. It's evident that the author did her research. This book is packed with historical detail and ambiance. You're almost literally dumped into Civil War Richmond and experience the passion of the Confederates, the explosions of the shells from nearby battlefields, and the misery of the prisoners in Libby Prison and on Belle Island. I commend the author for being able to pack this much information into a fictional novelization of the events. That being said, there are times where the historical facts given overshadow the story itself. At times, I felt distant from what our heroine and her spy ring were going through. The endless flow of facts and figures seemed to slow the action and drama of Lizzie's struggle for the Union. This didn't completely kill the book for me, as evidenced by how quickly I gobbled it up. But more balance between story and world building might have gone over better. The character of Lizzie was a completely new world to me. I'd never heard of this woman and what a crime is that?! She's a strong and intelligent woman not afraid to stand up to vigilantes, the Confederate army, nor members of her own family for her beliefs. I especially admired her pluck when facing the vigilantes. With some of the features described, they sound like the beginnings of the KKK. And they were some scary peoples! Lizzie's the kind of girl I'd love to know and talk to; I'm sure she has some dang good stories to tell. This is a fictional account of the real-life woman, Lizzie Van Hew. During the Civil War, Lizzie was a Union sympathizer living in Virginia, so she did what she could and would become the leader of a spy ring against the Confederates. This book is loosely based off her actions and times during the war. I randomly picked this book off the library shelf. It looked interesting. I love reading about the Civil War (although I tend to read most non-fiction on the subject than fiction) and had heard good things of the author, so why not? It wasn’t bad but it definitely wasn’t one of the best things I have read. I felt as if the characters were just out of my reach. Something was missing and the connection was just not there. I felt nothing for the characters, including the main ones, and that is a big no-no to me. Also, the story has a habit of just meandering. I became bored in sections and this book took me way longer to read than it should have. It was the kind of book that I could only read in some segments before becoming bored. On the bright side, the last third of the book did become more interesting and the author did well at description. It piqued my interest to want to know more information Lizzie Van Hew and I hope to read a non-fiction account on her soon. Not great but interesting enough that I may attempt her more popular book, Mrs. Lincoln’s Dressmaker….eventually. A Civil War story with very little about battles, soldiers or Generals. Elizabeth Van Lew is a Southern lady who owns slaves, is a secret abolitionist, supports the Union (secretly), loves Virginia and is a Union spy. Van Lew, a real person, was inducted into the Military Intelligence Hall of Fame in 1993. Throughout the war she aided the cause of the Union at great risk to herself, her family and friends. Her cleverness in remaining without suspicion is the conflict and plot of THE SPYMISTRESS. Chiaverini has written a book that makes Van Lew live again. The risks she took to aid Union prisoners held in deplorable Confederate prisons, especially Libby Prison, are clearly set forth. The way she came to be one of the most useful spies for the Union Army is stated so well that the reader, like Van Lew herself, is completely involved before realizing exactly what a dangerous endeavor she has undertaken. Those Virginians who supported the Union and were part of Van Lew’s network of spies are woven into the storyline. Chiaverini has clearly done her research into the life and times of a heroic woman. The book covers only the war years, but does include an author’s note to tell the reader what happened after the war.